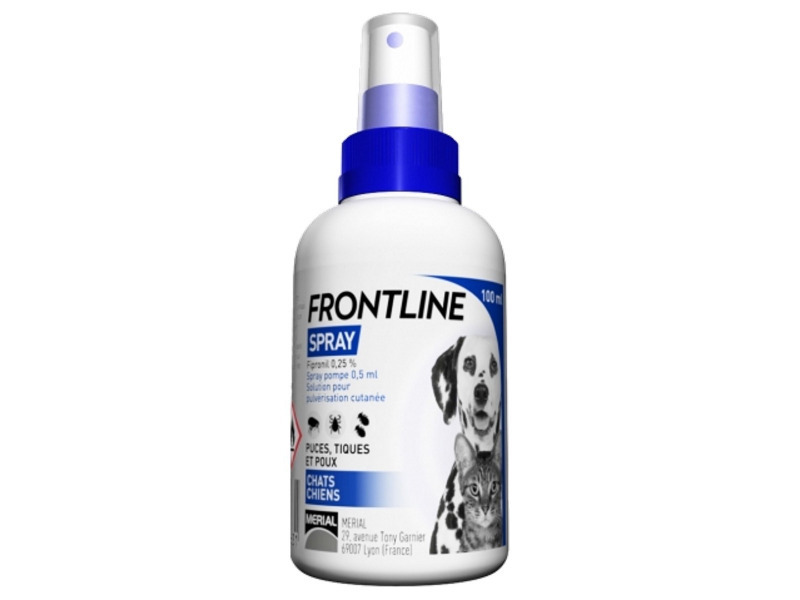 Frontline Spray is the original form of the popular flea treatment. These days Frontline is usually used as Frontline Spot On, but there are occasions when applying as a spray is more suitable. This tends to be more difficult to apply, but in some situations is more effective, and there is a longer persistence of activity. 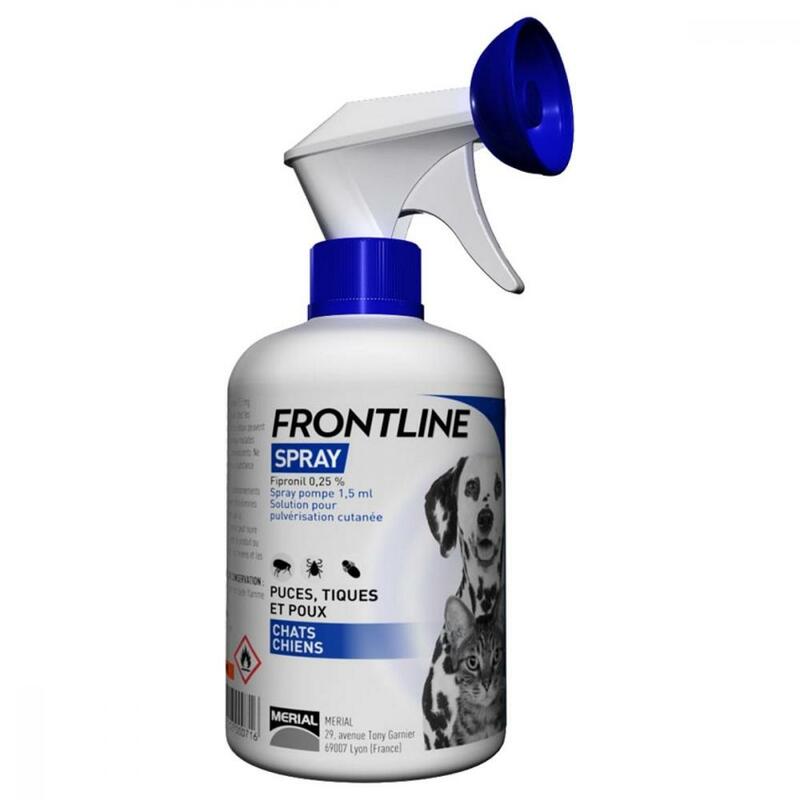 Frontline Spray is licensed for use in Cats and Dogs. It should not be used on rabbits. Clear, colourless to yellow cutaneous spray solution. The treatment and prevention of flea (Ctenocephalides species) and tick (Ixodes species) infestations in cats and dogs. The product can be used as part of a treatment strategy for Flea Allergy Dermatitis in cats and dogs where this has been previously diagnosed by a veterinary surgeon. The product controls infestations with Trichodectes canis biting lice on dogs, and Felicola subrostratus biting lice on cats. When treating infestations of parasites, all in-contact animals should be treated with an appropriate product at the same time. It is important to make sure that animals do not lick each other following treatment. This product can cause mucous membranes and eye irritation. Therefore, contact between the product and the mouth and eyes should be avoided. Following accidental ocular exposure the eye(s) should be rinsed carefully with clean water. People with a known hypersensitivity to fipronil or any of the other ingredients should avoid contact with the product. Avoid contents coming into contact with the fingers. If this occurs, wash hands with soap and water. Do not use simultaneously with other flea products which are applied directly on to the animal. Mechanical pump spray for external use. Adjust the pump nozzle to spray setting. Spray the entire body of the animal, and apply from a distance of approximately 10-20 cm. Apply against the lay of the hair and make sure that the entire coat of the animal is dampened. Ruffle the coat, especially in long haired animals, so that the product penetrates down to the skin. For treatment of the head region, and when treating young or nervous pets, application may be carried out by spraying onto a gloved hand and rubbing the product into the coat. Allow to dry naturally. Do not towel dry. In order to dampen the coat down to the skin, depending on the length of hair, apply 3 to 6 ml per kg bodyweight, (7.5 to 15 mg of active ingredient per kg bodyweight) i.e. 6 to 12 pump applications per kg bodyweight of the 100 ml presentation, or 2 to 4 pump applications of the 250 ml and 500 ml presentations. The 100ml pack contains approximately 8 treatments for a short haired medium sized cat (4 kg). The 250 ml pack contains approximately 4 treatments for a short haired medium sized dog (20 kg). The 500 ml pack contains approximately 8 treatments for a short haired medium sized dog (20 kg). The formulation contains a coating agent. Therefore, spraying builds up a film and makes the fur glossy. In the absence of safety studies, the minimum treatment interval is 4 weeks. The product is active for up to 3 months against fleas in dogs, and up to 2 months in cats, depending on the environmental challenge. It is effective against tick infestations for up to one month in dogs and cats, depending on the level of environmental challenge. Treatment of bedding, carpets and soft furnishings with a suitable insecticide will aid reduction in environmental challenge and maximize the duration of protection against re-infestation provided by the product. The product is not suitable for direct treatment of the environment. For optimum efficacy, it is not recommended to bathe or shampoo animals in the two days prior to or following treatment with the product. Bathing or shampooing up to four times in two months has been shown to have no significant effect on the residual efficacy of the product. Monthly treatment is recommended when more frequent shampooing is carried out. The risk of experiencing adverse effects may increase when overdosing, so animals should always be treated with the correct dose according to bodyweight. Copolymer of vinylpyrrolidin-2-one and vinyl acetate, Isopropyl alcohol, Water purified. Shelf life of the product as packaged for sale: 3 years. This veterinary medicinal product does not require any special temperature storage conditions. Highly flammable. Protect from direct sunlight. Mechanical pumps containing 100 ml (delivering 0.5 ml per spray), and 250 ml and 500 ml (delivering 1.5 ml per spray). Fipronil may adversely affect aquatic organisms. Do not contaminate ponds, waterways or ditches with the product or empty containers. Below are some recent questions we've received regarding Frontline Spray for Dogs & Cats, including answers from our team. Can this be used on 6 week old pups? 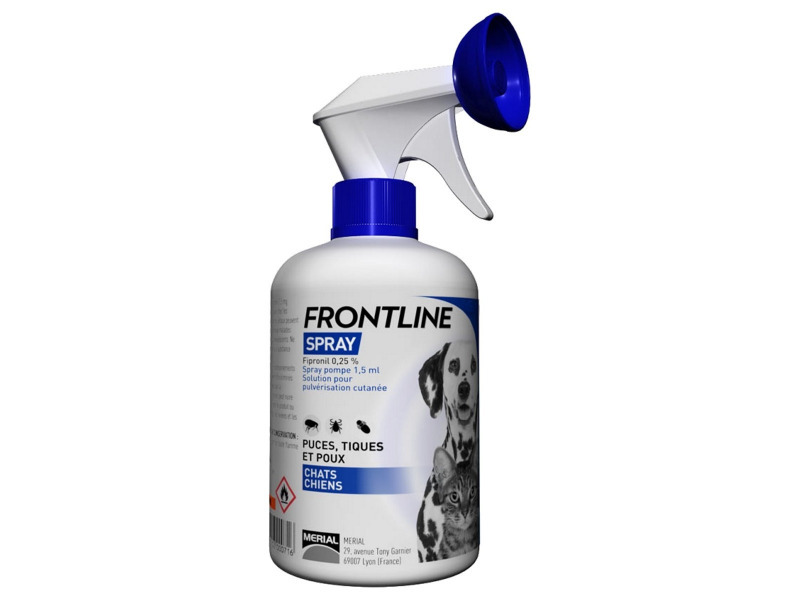 Yes, Frontline Spray can be safely used on puppies from 2 days old. Yes, Frontline spray can be an effective treatment for feather mites in horses. You will need to clip the feathers off first to allow contact with the skin first. Unlike Frontline spot-ons the spray is prescription only.